Der Junge ist mit meinen Supracolor Stiften und Twinkling H2Os ausgemalt. Wenn ihr wissen wollt, wie ich coloriere, dann schaut wieder bei mir rein, voraussichtlich am Freitag veröffentliche ich ein Video Tutorial darüber :) Ich habe den Jungen dann ausgeschnitten, einen schmalen Rand um ihn herum gelassen und auf Abstandshaltern aufgeklebt. The boy is coloured in with my Supracolor pens and Twinkling H2Os. If you are interested in how I colour my images, stay tuned. I'll post a video colouring tutorial on friday :) I cut around him leaving a small border and put him on foam blocks. Ich habe meine viereckigen Nestabilities verwendet um den Rahmen zu machen und abgerissenes Papier als Wellen. Der Himmel ist aus weissem Transparentpapier, die Vögel habe ich händisch dazugemalt. Auf dem Hintergrundpapier habe ich wieder meine neue Nähmaschine verwendet. I used my square Nestabilities to cut the frame and used teared paper for waves. The sky is white vellum, the birds are hand sketched. 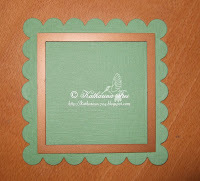 I did some sewing on the background paper with my new sewing machine. Paper: Stampin' Up scrapbooking kit "Crew kids - boy"
Oh Katharina was ist die entzückend. Ein Traum was Du aus diesem Sketch herausgeholt hast. Einfach knuffig. I think its more than perfect, stunning, love how you've made the scene in the square. Gorgeous card I love the little scene you have created. Wow..... This is wonderful. I like everything in this card!!! wow...die karte ist wundervoll geworden!!! Wonderful card ! I love the stamp and the colors ! Very great work ! Great card, love how you did the sky. süße karte hast du gezaubert !!!!!! gefällt mir super !! beautiful card, great colors ! I love your card, the details and colors. Die Karte ist wieder traumhaft schön. Freue mich schon auf Deinen Colorierkurs, denn das ist bei mir nach wie vor eine Schwachstelle. die karte ist ja total süss geworden und richig superschön. danke für deine karte zu meinem sketch auf ismaki. Wowzers!! this card is Fabulous...Amazing....the scene you created is Wonderful and the boy in the front not only is fabulously colored but stands out perfectly...all a work of art!!! Stunning work. Fab image too, love it. ganz entzückend der kleine Angler !! Gefällt mir sehr gut. waouh!!! your card is fantastic!!! I love everything!!! This rocks! Love the frame with the "water" in it! How clever! Your little fisherman is wonderful as well! Just too much fun! When I click on your link, I always know I'm going to see a great card! And I'm never disappointed! Oh my goodness, I am sooooo jealous of you Katharina!! How ever do you get your hands on those wonderful stamps!?? You did an amazing job on this card with the diamond shape and the little Hanglar boy! So beautiful!! Gorgeous card!! Love the image and your coloring is great!! I am amazed by the background. It really looks like water in the background! Great job! wow !!!!!!!!!!!!!! very fantastic card !!!!! 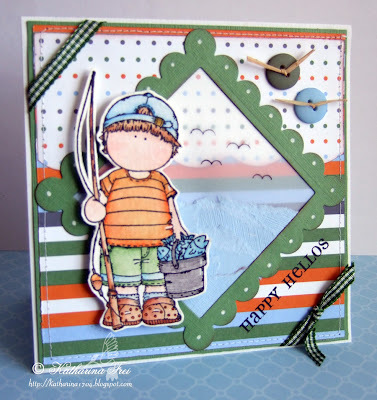 love the new H&S fishing boy stamp - it would be fabulous for boys of any age! waouh elle est adorable !!! Stunning card - an amazing scene. I love these images, but sadly I can't find anyone who stocks them in the UK!! I just drool over yours! I love everything about this card!! The background and the stamp are just darling!! I love the little sailboat too!! Nice job. Deine Karte ist so traumhaft schön! Die vielen kleinen Details .. bin - wie immer - schwer begeistert! Oh Katharina! What a beautiful card! Love what you did with the scenery! And of course your coloring is gorgeous,can't wait to see your tutorial! Wow, this is one amazing card! I love how you used the vellum! He is so cute...I love how you made the background scene with the birds and water. oh this is so adorable!! I love that little fisherboy!! Such a creative idea for vellum!! wow wow wow!! beautiful card, love the way you used the sketch!! That hanglar boy is fantastic!